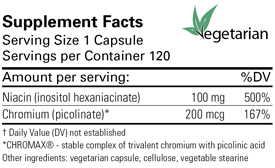 Chromium GTF has repeatedly shown its ability to enhance insulin effectiveness and support blood glucose regulation. 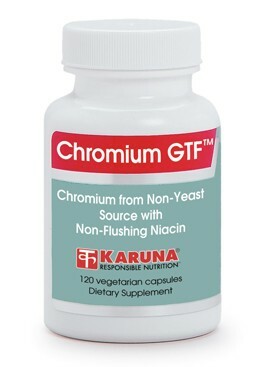 In addition to a highly bioavailable chromium complex not associated with yeast sources, Karuna's Chromium GTF contains 100 mg of inositol hexaniacinate (non-flushing niacin) in a synergistic combination that has been shown effective for maintaining healthy blood levels of both glucose and lipids. Chromium GTF supplies niacin, which may enhance the normalizing effects of chromium on the metabolism of lipids (J Fam Pract 1988;27:603-6; FASEB J 1991;5(6):A1645) and blood sugar (Metabolism 1987;36:896-9). Chromium GTF contains the non-flushing ester of niacin, inositol hexaniacinate. Suggested use for adults: One capsule daily, or as directed.